I have used an earlier Einhell machine and it saw me through all the projects for a book I was working on perfectly. It was small enough to stand on the bench and easily connected to a router or any other power tool. 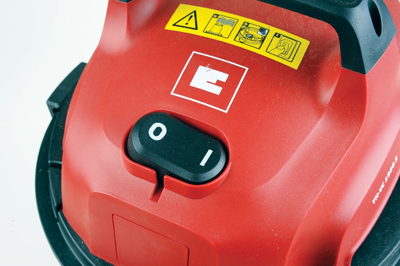 This model comes without plug-in auto switching but is still useful, and compact enough to keep next to you when working. This version is equally efficient to my old one and its simple drum construction makes emptying easy. 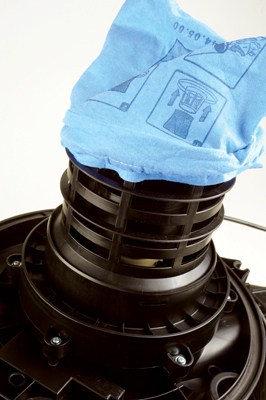 It will wet- or dry-vacuum and the float ball cage underneath the motor can have a foam filter slipped over it for wet vacuuming. 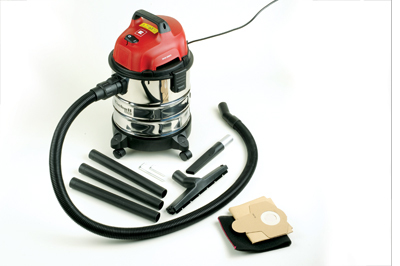 An additional filter bag is supplied for dry working plus a set of pipes and tools for cleaning. The hose can be attached to the rear outlet for blow action if you need it. The on-off switch is a large, easily pressed rocker switch. A nice, compact but powerful little unit when many others seem to be getting ever larger. Perfect to go in your van!